Blackwater Video Productions offers teleprompting services for any type of corporate or live television production. We have a 13" and a 17" LCD screen and beam splitter for camera mounted teleprompting. We can provide flat screen TV's (36", 42" and 52" or a video projector) for speeches and other presentations. We also have a presidential teleprompter systems for live events. ​We can get you a teleprompter and operator for your upcoming live event or production! Our on camera teleprompting systems are available for half day or full day rentals with an operator. 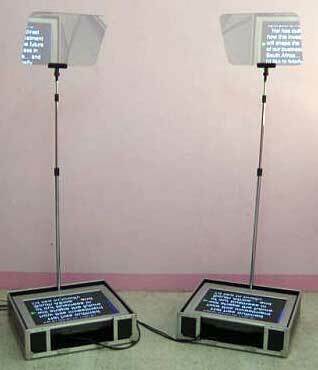 We have also provided teleprompter services for live TV and film production companies. Our past clients have included: House of Cards, Let It Snow, Banshee, American Ninja and many others. Our packages start with an operator and monitor, and we can build it out as large or as small as you need it to be. Basic Teleprompting setup $600 with composite cables and distro. We have a Presidential teleprompter system for speeches, events, and presentations. -Half day is 5 hours portal to portal. -Teleprompting services are COD, unless we approve credit. -Generally we recommend adding a PA for live TV and Off Camera teleprompting for TV shows and films.